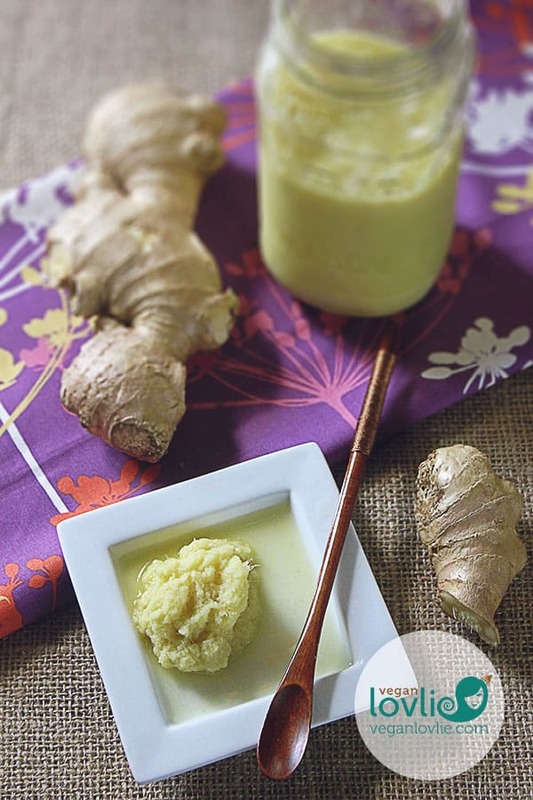 A simple tutorial on how to store ginger or garlic by making homemade ginger-garlic paste. This method preserves ginger and garlic refrigerated for months without the addition of any oil or salt. Enjoy the convenience of having pre-minced ginger or garlic ready to be used whenever needed. Sometimes ginger or garlic can go moldy when kept for a few weeks even in the fridge. In order to preserve mine, I usually pre-mince them and keep them in the refrigerator ready to be used. As you might have seen in some of my previous recipe videos, I very often have my jar of pre-minced ginger on hand. This saves me a lot of time whenever I need it for use in recipes. While minced ginger or garlic are usually readily available in grocery stores nowadays, making your own at home is not only cheaper but it does not take a lot of time and you can make it without any preservatives or additives like salt, oil or vinegar. 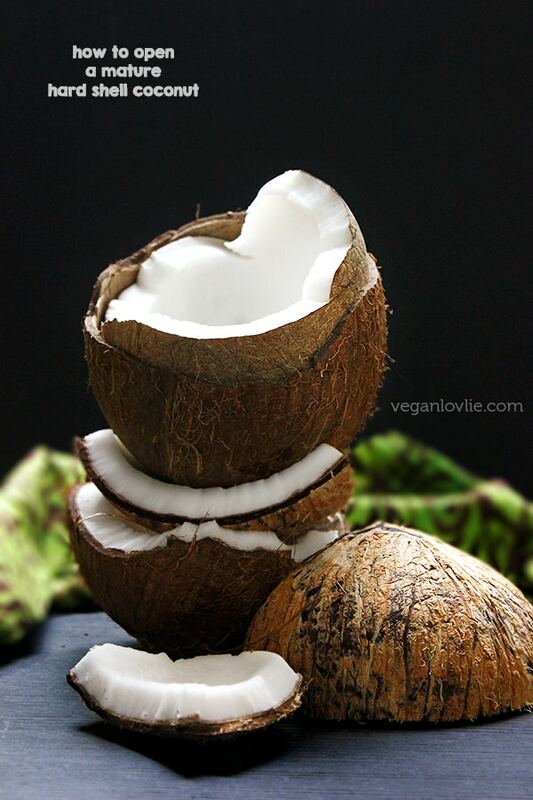 The taste also remains fresh if you store it properly. So, here are a few tips on how I prepare, mince and store ginger. You can do the same for garlic too. After washing the ginger roots, I like to peel them using either a small spoon or paring knife or a vegetable peeler. If you are using organic ginger, you may skip the peeling. In fact, my mum rarely peels her ginger and she grinds garlic together with it. I very rarely use garlic in my food because I am quite sensitive to it but if you use it, then you could mince the garlic together with the ginger in equal amounts. So, in that case, you would also peel the garlic first and then blend it together with the ginger with a little filtered water to help the blending process. It is important to use filtered water so that the minced ginger will last longer. You may also use boiled water but you’ll have to wait until the water is completely cooled before adding it to the ginger. Be mindful if mixing garlic and ginger together, sometimes the mixture might turn a greenish or aqua colour due to trace metals or other compounds in tap water which boiling does not remove. That’s why I prefer to use filtered water. But in any case, even with the colour change, the garlic or ginger paste is still safe to use. 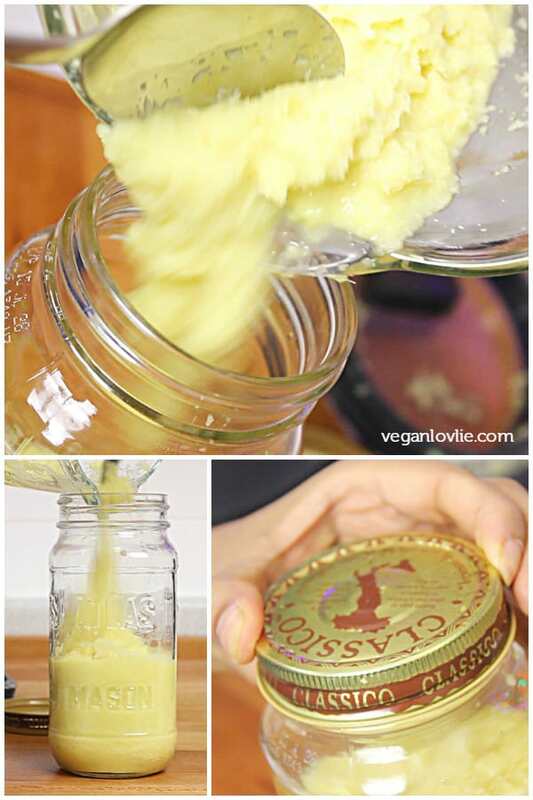 Just use as little water as needed to process the ginger then pour the paste into a clean jar. Make sure always to use a clean spoon when removing the ginger paste from the jar then immediately place the jar back in the refrigerator after each use. The minced ginger can last for up to 6 weeks and sometimes even more if kept properly. 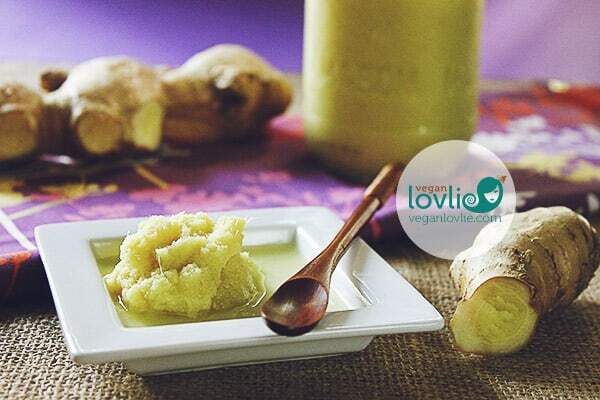 Enjoy the convenience of having pre-minced ginger or garlic ready to be used whenever needed. You’ll be glad you started doing this. 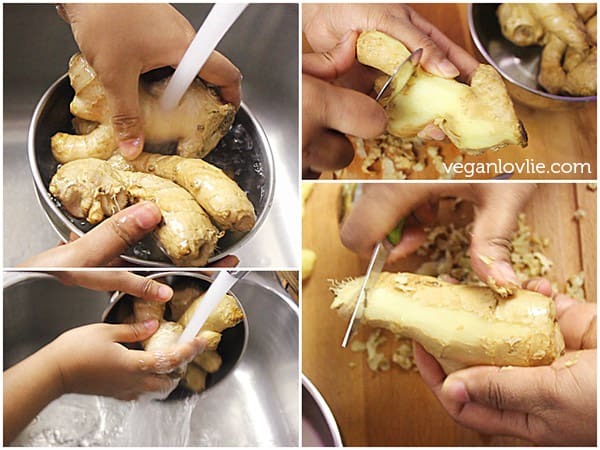 A simple tutorial on how make homemade ginger-garlic paste and preserve it refrigerated for months without the addition of any oil or salt. 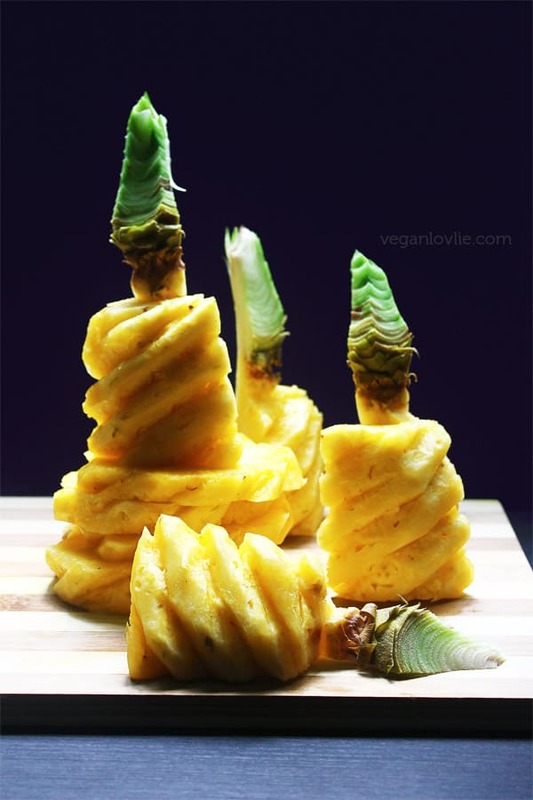 Enjoy the convenience of having pre-minced ginger or garlic ready to be used whenever needed. Wash and then peel the ginger and garlic (if using). 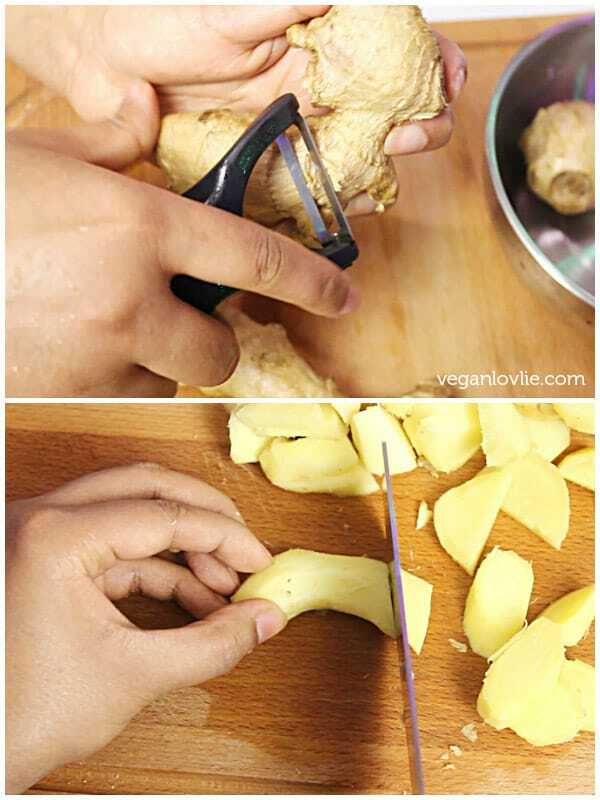 Chop the ginger into smaller pieces (about 1 - 2 cm, 0.5 - 1 inch). Place equal amounts of ginger and garlic in the blender. If you are keeping them separate, just blend them separately. Add a little water, as little as you can do with for easy blending. 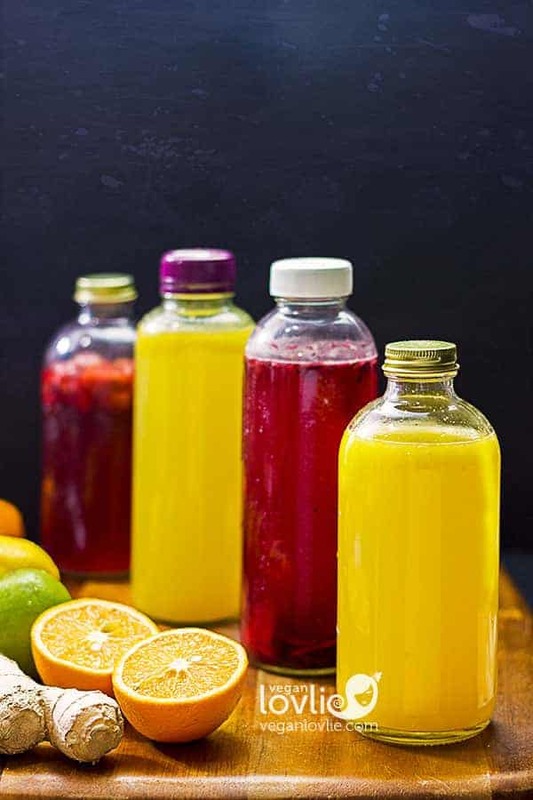 Keep refrigerated for 2 - 3 months. Always use a very clean spoon when taking the paste out of the jar. If you use ginger and garlic paste separately in recipes, just blend and keep them separate. It is important to use filtered water so that the minced ginger or garlic will last longer and to avoid contamination. You may also use boiled water but you’ll have to wait until the water is completely cooled before adding it to the ginger/garlic. Make sure the jar that you are using is really clean or sterile. To sterilize the jar, either place it in a 200C/400F oven boil it in water for 15 minutes. Great idea! Can’t believe I never thought to do this before. I buy organic ginger but I still scraped off about 3/4 of the skin. We drink quite a bit of ginger tea and I cook with it a lot. This will make it faster and easier! Thank you so much!